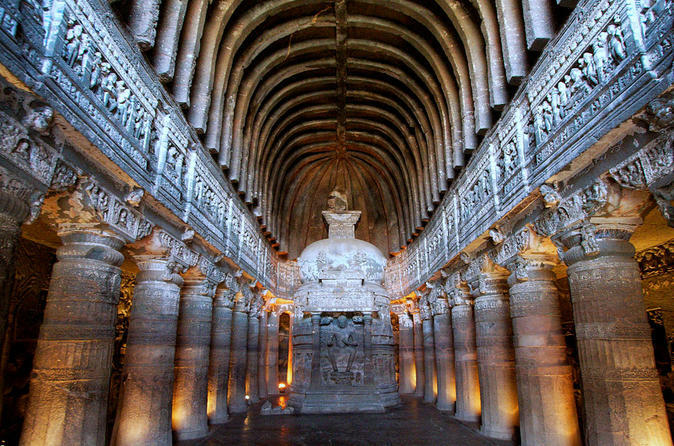 This private tour will take you to visit Ajanta's wondrous cave temples, a World Heritage site, that cut the rocks into a dramatic crescent-shaped gorge. On the top the gorge, there is a beautiful waterfall that drops over the mountain rim in a series of seven steps to a pool below. It is dated back to the 2nd century B.C. covering a span of 800 years and during the period professional artists helped Buddhist monks to create magnificent murals narrating the story of Buddha in his cycle of incarnations. The caves are etched and painted with vegetable and mineral dyes and the paintings have languorous beauty and magical eloquence. 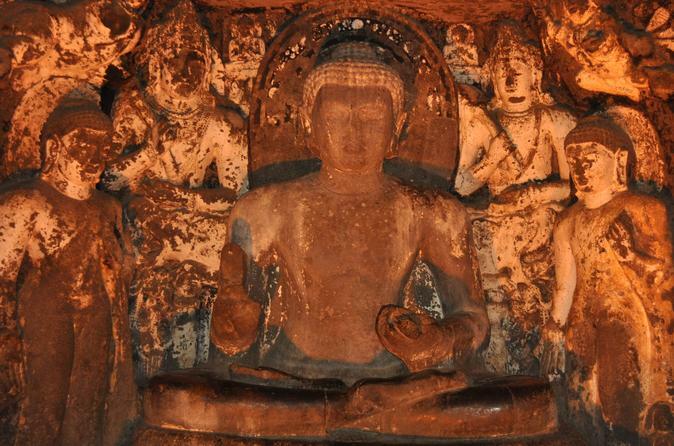 This private tour in Aurangabad will take you to visit Ajanta's wondrous cave temples are cut the rocky sides into of a dramatic crescent-shaped gorge. The caves are etched and painted with vegetable and mineral dyes. 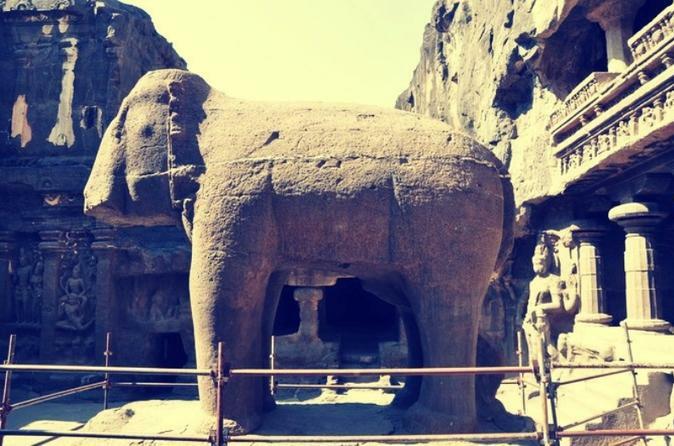 Followed by Ellora Cave, you will see the famous rock caves temples of Ellora that were constructed between the 5th and 8th centuries A.D to depict the Hindu, Buddhist and Jain faiths. Also see the architectural marvel of the monolithic Kailasa Temple, carved out in the rocky cliff-side from top to bottom. 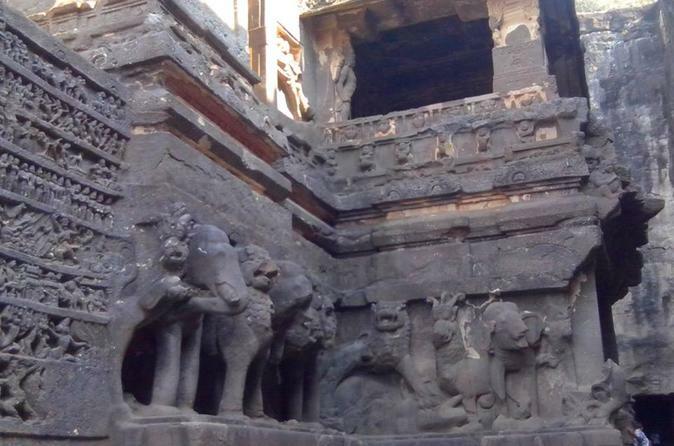 Join us for the private tour to Ellora with the famous rock cut caves temples of Ellora that depicts the Hindu, Buddhist and Jain faiths. Experience the architectural marvel of the monolithic Kailasa Temple carved out in the rocky cliff side from top to bottom followed by visits to Daulatabad Fort, Bibi Ka Maqbara, Grishneshwar Jyotirling Temple and Panchakki. 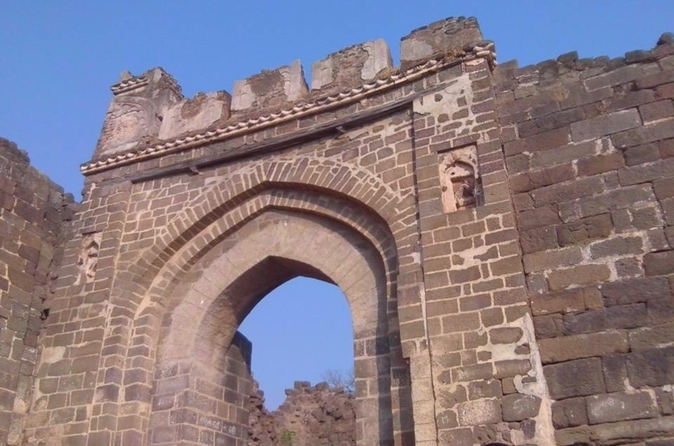 Explore the fascinating city of Aurangabad along with two UNESCO World Heritage Sites, the Ajanta Caves and the Ellora Caves, on this 3-day private tour. The tour includes airport transfers, transportation by air-conditioned vehicle and a guide for sightseeing. Your overnight stay in Aurangabad will be in either a 4-star or 5-star hotel, as per the option you select at checkout. Enjoy this 9-day tour to explore both the South and North India and see the Buddhist Caves of Ajanta and Ellora, fort of Daulatabad, the marvels of throbbing Mumbai, the lake city of Udaipur, the imposing fort of Chittorgarh, the sacred city Pushkar and lovely pink city of Jaipur. Make your trip more efficient and comfortable by traveling from Aurangabad to Mumbai and from Mumbai to Udaipur by air!